FOR OPERATION BY THE NEW YORK MUNICIPAL RAILWAY COMPANY. Already notable for cheap and expeditious transportation by its subway and elevated railroads, the City of New York is building a new system of rapid transit which, combined with the existing lines, will make the greatest city railroad system in the world. The new project is known as the Dual System of Rapid Transit, and it will include both underground and elevated construction. The existing rapid transit lines which will be embraced in the new system have 296 miles of single track. The Dual System will have 618 miles of track, more than double the present mileage, and will increase the transportation facilities in even greater ratio. When completed the new lines will be combined with the existing railroads and will be operated in two grand divisions, one by the Interborough Rapid Transit Company, which operates the existing subway and the elevated railroads in Manhattan and The Bronx, and the other by the New York Municipal Railway Corporation, formed for the purpose by the Brooklyn Rapid Transit Company, which controls the existing elevated railroads in Brooklyn. The construction and equipment of the new system will cost about $337,000,000, and it will be borne jointly by the City of New York and the two transit corporations. On March 19, 1913, the City of New York by the Public Service Commission for the First District entered into separate contracts with the Interborough Rapid Transit Company and the New York Municipal Railway Corporation for the construction, equipment and operation of the Dual System. The contracts, which had been approved previously by the Board of Estimate and Apportionment, were executed by Edward E. McCall, Chairman, and Travis H. Whitney, Secretary of the Public Service Commission, acting for the City; by Theodore P. Shonts, President, and H. M. Fisher, Secretary of the Interborough Rapid Transit Company; by Timothy S. Williams, President, and Harry A. Bullock, Secretary of the New York Municipal Railway Corporation (Brooklyn Rapid Transit). The contract for the third-tracking of the elevated lines in Manhattan and The Bronx was signed by D. W. McWilliams, Secretary, and E. T. Jeffery, Director of the Manhattan Railway Company, which owns the elevated railroads. Certain contracts were also signed by Frank Hedley, Vice-President of the Rapid Transit Subway Construction Company, which built the existing subway. Signing of the Dual System Contracts. 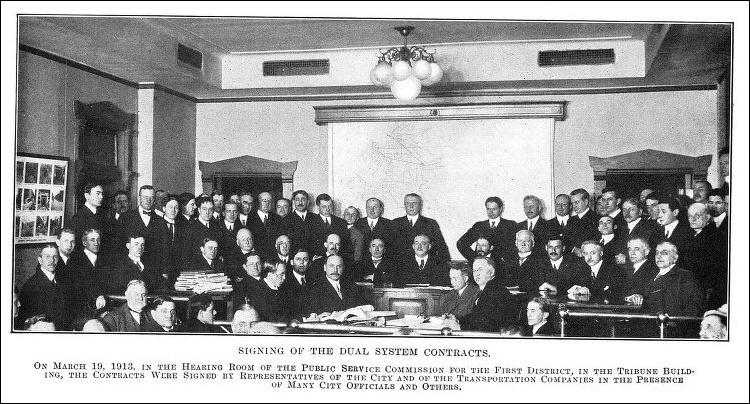 On March 19, 1913, in the Hearing Room of the Public Service Commission For the First District, in the Tribune Building, the Contracts Were Signed By Representatives of the City and of the Transportation Companies in the Presence of Many City officials and Others. As above stated, the existing trackage is 296 miles. Of this the Interborough Company now operates 191 and the Brooklyn Company 105 miles. New lines will add 322 miles of track, making a total of 618 miles. While this will be about double the existing mileage, the present facilities will be more than trebled, as the third-tracking and extensions of existing elevated railroads will materially enlarge their capacity. At present the existing rapid transit lines are carrying about 800,000,000 passengers per annum. The Dual System, if used to its full capacity, will be able to carry more than 3,000,000,000 in the same period of time. Hundreds of Millions to Be Invested. In addition to the above, the City of New York has already invested between $55,000,000 and $56,000,000 in the existing subway for its construction, and the Interborough Rapid Transit Company reports that it has expended about $48,000,000 in equipment on the same line. When the Dual System is completed, therefore, the City will have invested in rapid transit lines upwards of $226,000,000. It is provided in the contracts that the amount of money which the City has already expended or is obligated to expend upon new lines to be embraced in the Dual System shall be included as part of the City's total contribution. At the present time (June, 1913) the City's expenditures and obligations on this account amount to nearly $76,000,000. It is also stipulated that the Interborough Company shall be credited on its contribution with $3,000,000 for the Steinway Tunnel, already constructed under the East River from 42nd Street and Park Avenue, Manhattan, to Long Island City, Long Island, which will be turned over to the City and become part of the City-owned subway system. The City's construction work now going on includes the Fourth Avenue Subway in Brooklyn, the greater part of the Lexington Avenue Subway in Manhattan, with two sections in The Bronx, the Centre Street Loop Subway in Manhattan and the southern portion of the Broadway Subway in Manhattan, covering that part extending from Morris Street and Trinity Place northward to Broadway and Bleecker Street. The Lexington Avenue line and the Steinway Tunnel line will be operated by the Interborough Rapid Transit Company; the Fourth Avenue, Centre Street and Broadway lines by the Brooklyn company. To appreciate the extent of the Dual System it is necessary to have a clear understanding of the limitations of existing rapid transit lines. Owing to the location of New York City and the peculiar conformation of its five boroughs, its rapid transit requirements are exceedingly difficult to satisfy. The business district of the Greater City, which is the goal of all transportation lines, is composed of that part of Manhattan Island lying south of 59th Street. Generally speaking, the northern part of this district is the locale of hotels, theaters and retail stores, while the southern part is the site of financial institutions, wholesale merchants, municipal offices, courts, railroad freight terminals and general office buildings. Travel on City transportation lines is, therefore, all toward this district in the morning and all away from it in the evening. Existing Subway and Elevated Lines of the Interborough Rapid Transit Co., September 1912. (1) Manhattan and The Bronx. (a) The existing subway. This is owned by the City of New York and operated on a lease by the Interborough Rapid Transit Company. It consists of 26 miles of road (73 miles of single track) running from Flatbush and Atlantic Avenues in Brooklyn to and under the East River to the lower part of Manhattan, up the east side of Manhattan to 42nd Street, west through 42nd Street to Broadway and up Broadway to 96th Street, where one branch continues out Broadway to Van Cortlandt Park, or 242nd Street, and another branch out Lenox Avenue and other streets to Bronx Park, or 180th Street. The length in Manhattan and The Bronx alone is 23 miles of road and 68 miles of track, there being 2.5 miles of road and 5 miles of single track under the East River and in Brooklyn. (b) The Manhattan Elevated lines owned by the Manhattan Railway Company and operated under lease by the Interborough Rapid Transit Company. These railroads cover 37.68 miles of road and 118 miles of single track. There are three main systems, the Second Avenue, the Third Avenue, and the Ninth Avenue lines. There is also the Sixth Avenue road, which is a separate line south of 53rd Street but uses the tracks of the Ninth Avenue line from 53rd Street north to 155th Street and Eighth Avenue, the terminus of both the Sixth and Ninth Avenue lines. (c) Hudson and Manhattan Railroad. This is the system popularly known as the McAdoo tubes. It consists of two sets of tunnels running from New Jersey under the Hudson River to Manhattan, those at the south terminating at Church Street and those at the north entering Manhattan through Morton Street, running thence as a subway up Sixth Avenue as far as 33rd Street. The system in Manhattan has 3.2 miles of road and 7.1 miles of single track. This railroad is not embraced in the Dual System, but it may be used by transfer to connect the New York Municipal Railway system with the Grand Central Station. Existing Elevated Lines of the Brooklyn Rapid Transit Co., September 1912. (a) The Brooklyn Union Elevated Railroad System. This consists of various lines of elevated railroad leading from all outlying parts of Brooklyn and a section of Queens to the East River and Manhattan. They include the Broadway line, the Myrtle Avenue line, the Lexington Avenue line, the Cypress Hills line, the Fulton Street line, the City Line, Brighton Beach line, the Culver line, the Sea Beach line, the New Utrecht Avenue line, the Fifth Avenue line and the Third Avenue line. These roads now send their passengers into Manhattan over the Brooklyn and Williamsburg Bridges, by far the greater number over the Brooklyn Bridge. They include 58 miles of road and 105 miles of single track. (b) The subway. This is owned by the City and operated by the Interborough Rapid Transit Company in connection with the subway system in Manhattan. Passengers from various other lines and from all parts of Brooklyn come to Manhattan by this subway through the tunnel under the East River. The suburbs in New Jersey send large numbers of passengers into the business district of Manhattan every day. These are brought to the west shore of the Hudson River by steam or electric railroads and thence come into Manhattan either by the Pennsylvania tunnel, the McAdoo tubes or various ferry lines. The need for additional rapid transit is shown by the fact that all of these avenues of transportation were congested during the rush hours and that the congestion is increasing from year to year. The problem before the Public Service Commission was to provide relief in every direction. It was to do this that the Dual System was planned. Dual System of Rapid Transit, September 1912. The Dual System takes its name from the participation in the scheme of the two great transportation companies of the City, the Interborough Rapid Transit Company and the Brooklyn Rapid Transit Company. The new lines are planned to extend and enlarge the existing system of each company. Enlargement of Interborough Company's Territory. In the Interborough's territory the existing subway will be extended on the east side from Park Avenue and 42nd Street north through Lexington Avenue to The Bronx, and on the west side from 42nd Street and Broadway south through Seventh Avenue and other streets to the lower part of Manhattan to a new tunnel connection with the subway line in Brooklyn. This line will be extended from its present terminus at Flatbush and Atlantic Avenues out Flatbush Avenue and Eastern Parkway, East 98th Street and Livonia Avenue to New Lots Avenue, with a branch from Eastern Parkway down Nostrand Avenue to Flatbush Avenue. The Lexington Avenue Subway will have two branches in The Bronx, one running up Jerome Avenue to Woodlawn Road and the other out Southern Boulevard and Westchester Avenue to Pelham Bay Park. Both of these extensions will be elevated railroads in the outlying districts. The existing subway, now terminating at Bronx Park or 180th Street, will be extended as an elevated line out White Plains Road to 241st Street or Becker Avenue. The company will extend the Third Avenue elevated railroad, now terminating at Bronx Park, through Webster Avenue and Gun Hill Road to a junction with the proposed line in White Plains Road. The Ninth Avenue elevated line, now terminating at 155th Street and Eighth Avenue, will be extended across the Harlem River and mainly through West 162nd Street to a junction with the proposed line in Jerome Avenue. Physical connection will be made between the Lenox Avenue branch of the existing subway and between the proposed Jerome Avenue line and the existing Third Avenue elevated railroad. These connections will be made at the intersection of 149th Street with the respective lines. The Second Avenue elevated railroad will be extended from 58th Street across the Queensborough Bridge to the Queens Plaza, where it will join the proposed elevated railroads to Astoria and Corona. These lines, while owned by the City, will be operated jointly by both companies. The Steinway Tunnel is to be extended from its present western terminus at Park Avenue and 42nd Street to Times Square, and from its eastern terminus in Long Island City to a junction with the Astoria and Corona lines on the Queens Plaza of the Queensborough Bridge. The Interborough Company, therefore, will be able to operate trains from the Queens lines either over the bridge to the Second Avenue elevated road or through the Steinway Tunnel to the subway in Manhattan. The Brooklyn territory up to the present time has been bounded by the East River, although the elevated railroads have the right to bring their passengers into Manhattan over the Brooklyn and Williamsburg Bridges. This operation, however, ends at the Manhattan terminal, from which their passengers must take other lines of transportation at an additional fare to reach their destinations in Manhattan. The Dual System will remove this abnormal condition and give the Brooklyn company a system of subways in Manhattan, by means of which it shall distribute its passengers through the territory south of 59th Street. Thus the present congestion at the Manhattan terminals of the bridges will be ended and the passengers from Brooklyn will be enabled to reach their destinations in lower Manhattan without change of cars or the payment of an additional fare. To this end a new subway will be constructed for operation by the Brooklyn company, beginning at the Queensborough Bridge and running thence westward through 59th and 60th Streets to Seventh Avenue, south through Seventh Avenue to 42nd Street and from that point down Broadway to Vesey Street and thence under private property and through Church Street and Trinity Place to a connection with a proposed tunnel under the East River from Whitehall Street, Manhattan, to Montague Street, Brooklyn, and through Montague Street to a connection with the Fourth Avenue Subway. This tunnel will be connected also with the Centre Street line by an extension of the latter down Nassau Street to Broad Street. Trains now coming over the Brooklyn and Williamsburg Bridges will connect with the Broadway line through the Centre Street Loop Subway, which runs from the Manhattan end of the Williamsburg Bridge through Delancey Street Extension to Centre Street and down Centre Street to the Brooklyn Bridge, with a spur at Canal Street connecting with the Manhattan Bridge. The Fourth Avenue Subway, which will also be operated by the Brooklyn company, will thus be enabled to send its trains into Manhattan over the Manhattan Bridge or through the Whitehall-Montague Street tunnel. Those coming over the Manhattan Bridge will reach the Broadway line by an extension to be built through Canal Street from the Manhattan Bridge to Broadway. On the Brooklyn side of the river the Fourth Avenue Subway will extend from the Manhattan Bridge to 86th Street and Fourth Avenue, which is near Fort Hamilton. It will be connected with the existing South Brooklyn lines of the Brooklyn company, which will be reconstructed as elevated railroads. These lines are the Culver line, the New Utrecht Avenue line and the Sea Beach line. Connection with the Fourth Avenue Subway will be made at 38th Street and Fourth Avenue. When the connections with the Culver line and the New Utrecht Avenue line are made elevated trains can be operated without change from Manhattan to Coney Island. By a new subway through St. Felix Street and Flatbush Avenue the northern portion of the Fourth Avenue Subway will be connected with the existing Brighton Beach line of the Brooklyn company. All the other existing elevated lines of the Brooklyn company will become a part of the new system, and many of them will be extended and supplied with additional tracks for express traffic. The Brooklyn company is also to operate a new subway under 14th Street, Manhattan, with a tunnel under the East River to the Greenpoint section of Brooklyn and East New York. This line, known as the Eastern District Subway, will connect with the Broadway and Cypress Hills lines of the existing elevated system. As before stated, the Brooklyn company will have trackage rights over the Astoria and Corona lines in Queens, trains from which will run over the Queensborough Bridge and into the Broadway Subway through 59th and 60th Streets and Seventh Avenue. Five Cent Fare on Each System. The contracts provide for a single fare of five cents on each system, with free transfers at intersecting points for a continuous ride in the same general direction. In the Brooklyn system transfers will be exchanged between the elevated lines and the subway lines, but in the Interborough system only such transfers as are now given will be provided between the elevated railroads and the subway. On the existing lines, as they stand today, the longest ride obtainable for five cents is through the subway from Atlantic Avenue, Brooklyn, to Van Cortlandt Park or 242d Street, on the Broadway branch, a distance of seventeen and a half miles. Under the Dual System it will be possible for a passenger to travel over the Interborough Subway from the terminus of the White Plains Road line, near the northern City boundary, the whole length of The Bronx and Manhattan, under the East River to Brooklyn, and through the Eastern Parkway Subway and its extensions to New Lots Avenue, a distance of about twenty-six miles, for one fare and without change of cars. The longest possible ride on the Brooklyn system will be from Flushing, at the end of the Corona branch, to and across the Queensborough Bridge, through the Broadway Subway in Manhattan, under the East River to Brooklyn and through the Fourth Avenue Subway and its connections to Coney Island, a distance of about twenty-one miles. As soon as the connections of the Fourth Avenue Subway in Brooklyn with the elevated lines are made and through train operation is possible from Manhattan to Coney Island the five cent fare between these points will apply. This, it is estimated, will take about eighteen months. In the meantime the ten cent rate will prevail, except as already modified by the present arrangement for a five cent fare during certain hours. Every borough in the Greater City will share in the benefits conferred by the Dual System. The contracts contemplate that the whole system will be in operation in the year 1917, but it is also expected that parts of the system will be put into operation from time to time, as each part is completed, so that long before the time set for complete operation the community will realize in part the benefits of the new lines. This will be possible because certain parts of the new system have been already constructed or so nearly completed that their operation will be possible before the completion of lines the construction of which is yet to be undertaken. These parts are the Steinway Tunnel, the Centre Street Loop Subway and the Fourth Avenue Subway. As before stated, the Steinway Tunnel was built by the New York and Long Island Railroad Company, owned by the Interborough Rapid Transit Company, which has contracted to turn it over to the City of New York as a part of the subway system. The tunnel is now completed from 42nd Street and Park Avenue, Manhattan, under the East River to Long Island City. With some changes and improvements it will be possible to operate cars through the tunnel as soon as the necessary equipment can be installed. In order to put the tunnel into use, therefore, the contracts provide that the Public Service Commission and the company may make an agreement for the temporary operation of the completed portion, with transfers to and from the existing subway at 42nd Street. The Commission has called upon the company to enter into such an agreement and temporary operation on this plan may be expected before the end of the year. Steps have been taken also to utilize the Centre Street Loop Subway, now practically completed, before the connections provided by the Dual System contracts are built. Soon after the contracts were signed the Public Service Commission received an application from the New York Municipal Railway Corporation for permission to equip and operate temporarily the two westerly tracks in this subway. This permission was granted and the company is now engaged in laying rails, stringing wires and connecting the subway with the tracks over the Williamsburg Bridge. When this is completed the Brooklyn company will be enabled to operate the elevated trains now coming over the Williamsburg Bridge through this subway to Canal Street and City Hall. It is expected that this temporary operation will begin by August 1, 1913. Temporary operation of the Fourth Avenue Subway in Brooklyn is also in prospect. It is possible that the Brooklyn company will be able to operate trains from 43rd Street, Brooklyn, through this subway, across the Manhattan Bridge and into the Centre Street Loop within a short time. Great Relief by Elevated Improvements. From these three sources the earliest relief may be expected. Next in order will come the relief which will be provided by the extensions and third-tracking of the elevated lines in Manhattan, The Bronx, Brooklyn and Queens. Generally speaking, these elevated improvements can be completed in 18 months after work is started, so that within two years there should be substantial relief in this direction. The addition of a third track to the existing elevated railroads will enable the companies to inaugurate through express service on all lines, where it is now possible to give only a local service or a partial express service and partial local service. In Brooklyn there is now no through express service possible because the elevated lines have only two tracks each, and the establishment of such a service on these lines of itself will almost work a revolution in traffic. In Manhattan there has been for some years an excellent express service on the Ninth Avenue elevated line between 116th Street and downtown points. When the improvements are made this service will be extended to 155th Street, and further when the connection with the Jerome Avenue extension of the subway is completed. The present express service from the Harlem River to 42nd Street on the Third Avenue elevated line will be extended by the new third tracking south to Chatham Square and on the north side of the Harlem to 145th Street, and later clear to the City line on the Webster Avenue extension and the White Plains Road line. In advance of complete operation it is difficult to forecast the advantages which the Dual System will confer upon the Greater City. If it were possible to put the whole system in operation today it would work a complete revolution in local traffic, but as different parts will be placed in operation from time to time the improvement will come gradually. Nevertheless the improvement in traffic conditions will be such that citizens in every borough will feel its benefits. In the Borough of Manhattan the additional subway facilities will be about five times those provided by the existing subway. The Lexington Avenue and Seventh Avenue lines alone will be more than a duplication of the existing subway, and combined with it will carry three times as many passengers. The new four-track subway for the Brooklyn company in addition will supply the district south of 59th Street with a new line having greater capacity than the existing subway. The addition of third-tracks on the Second and Third Avenue elevated railroads south of 42nd Street will nearly double the capacity of those lines during the rush hours. It is therefore not extravagant to say that when the Dual System is in full operation that part of Manhattan south of 59th Street will have five times the rapid transit facilities that it has today, and travelers will have the choice of three lines of subway and four lines of elevated railroads; with express service all day in the subways and during the rush hours on the elevated roads. North of 59th Street the new service will be at least three times that afforded by the present lines, due to the four tracks in the new Lexington Avenue Subway and the extensions of and third-tracks on the elevated lines northward of their present termini. The above applies to north and south traffic only. The new system also will provide several new cross-town lines, as well as several new lines to Brooklyn by tunnels and bridges. The Brooklyn company will operate a new subway from Seventh Avenue east through 59th Street and 60th Street to the Queensborough Bridge over the East River. The Interborough Company will operate a new subway from Times Square east through 42nd Street into the Steinway Tunnel under the East River to Long Island City. The Brooklyn company will operate a new subway from Sixth Avenue under 14th Street and by tunnel under the East River to the Greenpoint and Eastern District sections of Brooklyn. All these new cross-town lines will be connected with the north and south lines of the respective companies, so that passengers using the latter may transfer to them without paying an additional fare. Brooklyn and Queens to Reap Great Benefits. In Brooklyn and Queens it is almost impossible to exaggerate the improvement of general transit conditions which will follow the completion of the Dual System. Rapid transit trains from Brooklyn now enter Manhattan only by the subway tunnel under the East River, the Brooklyn Bridge and the Williamsburg Bridge. Queens has no rapid transit connection at all with Manhattan, its only rail communication being by trolley cars over the Queensborough Bridge and the trains of the Long Island Railroad. Under the new system there will be three additional tunnels under the East River between Brooklyn and Manhattan, one for operation by the Interborough Company and two by the Brooklyn company. In addition the Manhattan Bridge will be utilized to bring into Manhattan trains coming from the South Brooklyn elevated lines and the Fourth Avenue Subway. These new entrances will double the facilities of the Interborough Company and quadruple those of the Brooklyn company. The Borough of Queens will be connected with Manhattan by two rapid transit lines operating over the Queensborough Bridge, connecting respectively with the Second Avenue elevated and the Brooklyn company's subway, and another connection by the Steinway Tunnel which will connect on the Manhattan side with the existing subway. These improvements will give to the Borough of Queens three entirely new rapid transit entrances into Manhattan. Aside from all this the third-tracking and extensions of the elevated railroads in Brooklyn and Queens will practically double the present capacity of those lines during rush hours, for the third tracks will be used in the morning for express trains coming into Manhattan and in the evening for express trains going away from Manhattan, a service that is almost unknown at present. The Fourth Avenue Subway and its connections with the South Brooklyn elevated lines will provide an entirely new avenue of travel between Manhattan and the ocean beaches. In Manhattan itself the new Broadway Subway, running from 59th Street almost to the Battery, will provide a distributing line through the business district of Manhattan for all Brooklyn traffic which is now halted at the East River. Bronx Facilities to Be Quadrupled. Rapid transit facilities in The Bronx will be more than quadrupled by the completion of the Dual System. Practically four entirely new lines of rapid transit railroads will be constructed in that borough. The Lexington Avenue Subway will have two branches, one extending up Jerome Avenue to Woodlawn Road, and the other up Southern Boulevard and Westchester Avenue to Pelham Bay Park. In addition there will be the White Plains Road line, which will be an extension of the Bronx Park branch of the existing subway, and will run clear to 241st Street, near the City Line. Connecting with this line will be the Webster Avenue extension of the Third Avenue elevated. A connection will be made between the Third Avenue elevated and the existing subway at 149th Street; also between the existing subway and the Jerome Avenue branch at 149th Street. Another connection will be made between the Ninth Avenue elevated line from its present terminus at 155th Street and Eighth Avenue with the Jerome Avenue line at 162nd Street. This will make possible the joint use of these new lines by trains from subway and elevated lines. Through express service on both subway and elevated lines from the northern termini of the new roads will be possible. Residents of all parts of The Bronx will be given their choice of lines downtown. so that they will be able to go either by subway or elevated trains down the east side or down the west side of Manhattan. While Richmond will not profit immediately from the Dual System, it has been recognized. The Dual System plans provide for a tunnel under the Narrows from South Brooklyn to Staten Island. This tunnel will leave the Fourth Avenue Subway in Brooklyn at 65th Street and will enter Staten Island midway between St. George and Stapleton, with branches to each. Eventually it will be built and operated as an extension of the new system. but for the present no provision has been made for its construction.